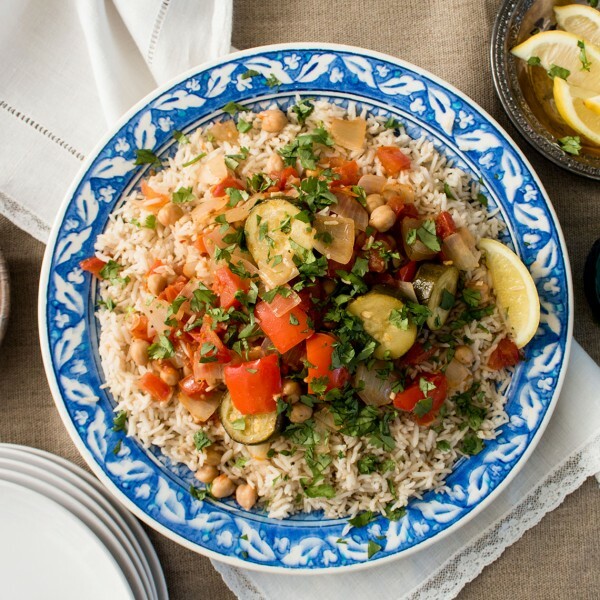 In a slow cooker toss together chickpeas, zucchini, pepper, tomatoes, onion, oil, garlic, cumin, coriander, ½ teaspoon salt, pepper, and pepper flakes. Cover and cook on high for 4 hours. In a medium saucepan combine rice, 3 cups water, and ½ teaspoon salt. Bring to a boil, cover, reduce heat to medium-low and simmer until tender, 20 minutes. Serve vegetables over rice and sprinkle with parsley.